Judging by photographs alone, designer Hubert de Givenchy is a man who is comfortable in his skin (and in his well-tailored, but understated, clothes); he always appears at ease — though his eyes often have a dreamy and sad air about them. I can’t imagine Givenchy having a temper tantrum, but I can believe the restrained and lovely Vétyver is his favorite cologne. Vétyver debuted in 1959 and it was discontinued after Givenchy retired in 1995. Vétyver is a member of Les Mythiques — a group of classic Givenchy fragrances that have been re-launched in newly designed packaging. Vétyver contains bergamot, coriander leaves, sandalwood, and three varieties of vetiver — the “outfit” is simple, but deluxe. Often, when I reach for a bottle of perfume, I feel as if I’m approaching a personality that I will be spending hours of my day with; some days as I look over the rows of bottles in my cabinet I yearn for giggles (Annick Goutal Duel — to me, this bright fragrance is more ‘pillow fight’ than ‘classic duel with pistols’), on other days I want a languorous conversation — punctuated with a kiss or two (Parfumerie Generale Querelle), and occasionally I may want to reminisce about the past (Guerlain Jicky). I reach for Vétyver when I feel a need for serenity — Vétyver whispers. Vétyver is a “calm” and well-blended fragrance; it starts with citrusy, fizzy vetiver and proceeds quickly to a deep, dusty vetiver aroma. Vétyver stays close to the skin and because of its chic simplicity (it’s all about smooth, sophisticated vetiver) it layers well with other fragrances, especially citrus perfumes. 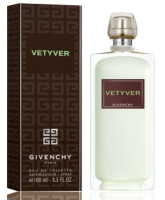 Givenchy Vétyver is available in a 100 ml spray for $65. Other masculine fragrances in the Givenchy Les Mythiques collection are: Monsieur de Givenchy, Xeryus and Insensé. 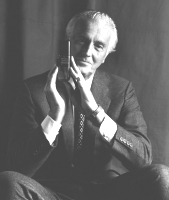 Note: image of Hubert de Givenchy via Sephora. what elegance (M. Hubert). I miss that – you just don't see it very often anymore. R: to the “sacks and shoes” we must add PERFUME too, right? Surely perfume generates more $$ than even shoes/handbags? Certainly…have been trying to find again a quote from Yves Saint Laurent where someone asked him what percentage of the proceeds came from perfume, and it was something huge, well over 50%. Guessing that is true for many fashion houses now…the perfume finances the fashion business. My darling, I live in the Groin of Corn. I have not seen a pair of tailored mens slacks in the two years I've lived here. Lots of gimme caps and actual overalls. If M. de Givenchy were to come here he would probably faint. Robin, that comment you are looking for was in Chandler Burr's book (the one about JCE and SJP, I believe). I remember it because I never think of YSL as an actual businessman – but indeed he is! I recently lunched with a woman who wore an incredible structured jacket and skirt….she looked phenomenal! Here's to the resumption of structure, design and elegance……Please! thank you for the review. This one (along with Insense and Monsieur) has been on my list for a while. How would you compare the Givenchy to the Guerlain? Nice review, Kevin. I really need to add one good vetiver to my nascent collection at some point (maybe not until fall). I've had my eye on Sel de Vetiver, but I really need to sample a lot of others. This Givenchy sounds nice; I think Guerlain and Hermès Vetiver Tonka will need to be on my list as well. What's your favorite vetiver? Was Xeryus actually discontinued or just repackaged for Les Mythiques? I just remember it being SO ubiquitous. Have a great weekend. monkeytoe: not terribly far apart; to me the Givenchy is smoother and softer. If you are not a vetiver fanatic like I am, you may not need both. I don't know if it will work better on you but Sel de Vetiver, gorgeous though it is (and it is) is so fugitive on my skin as to not even count as a fragrance. As a matter of fact, the first time I applied it I thought I'd missed my wrist! Perhaps you've had better luck with it? If I was a man, I'd want to be just like M. de Givenchy. I had not planned on buying a vetiver any time soon, but I think you just sold me on this one. Lovely box and bottle, too. Thanks for another terrific review, Kevin. Your review is reminding me of another 'serene' vetiver: Vettiveru (Cologne Series) by Comme des Garcons. How would you compare the two? You make it sound like those “Escentric Molecule” variations (which I'm actually curious about but have not sniffed). Hmm, I need to pull out my SdV sample and try again — I remember liking it a lot even if it is very short-lasting. Then again, short lasting is the bane of my existence — I swear I need to reapply so many frags every 3 hours unless I really drench myself in them (except when I do that, I'm sure it doesn't please ALL of my fellow morning bus-riders). Mike: LORD! how did I miss Vettiveru??? Mamma/Joe: SdV didn't last on my skin either…gone in a flash. And Mamma! Where in the world do you live…somewhere in the heartland I assume. Hilarious image: corncobs + groin: ouch in more ways than one…. Heck, I'd be happy being Mme de Givenchy! That's assuming his manners and mien are as elegant as his looks. I can't imagine seeing M. Hubert in overalls and a gimme cap, can you? LOL — I agree about the resumption of structure, design and elegance, but for other people, not me. Givenchy would faint if he saw my closet, I'm sure, and while I'm not yet in overalls, I probably would be if I thought I could get away with it. But I'd smell good! ahtx: they are ALL at my local, downtown Seattle, Nordstrom. Thank you for profiling a truly excellent Vetiver. I'd like to bring another lesser known Vetiver to your, as indeed your readers', attention: Vetiver de Puig. A very different, but no less enchanting, take on the note relative to the Guerlain and the Givenchy. I hope you'll enjoy it as much as I did. This was one of my favorite purchases this year, and I don't even wear it, lo! But it smells great on my DH. This may be heresy to some, but I even prefer it to Guerlain's. They had all of the series at my nearest Nordstrom's, too, and I thought they were all beautifully done. Why don't they get more promotion? I wonder. I think I should buy another bottle of the Vetyver before it disappears. I am living the Lisa Haney Life, I swear! I, along with my Manolos and bespoke dresses and wine cellar and Graff Lifetime Achievement Award, was unceremoniously PLUCKED from civilization (Chicago/SanFrancisco) and dropped into this little corn town. Hilarity ensues. Go to bearboring.com – there's a little, funny link about where I am. ps. nice to see you visit over at the PP! I'm Musette over there, babbling about Elixir de M.
Wah, how did I miss this! Just read the comments. Popping in late to say I thought the Givenchy was lovely and I am not the queen of Vetiver… to my nose the Guerlain was more cologne-ish — citrus at the top, maybe some musk? — and the Givenchy was pretty much vetiver. I prefer the Guerlain but would think vetiver freaks would prefer the Givenchy. And they have the complete set at the Tysons Nordstrom but not at the Maryland one – maybe it's just in higher volume stores. I want to try the re-issued L'Interdit and Le De, and I'm hearing they are wisps, if not exactly distortions, of their former selves. Or at any rate, different. Could anyone here comment? Karthic: I'll try to find the Puig … very difficult in the states. Ann: I don't think they are limited edition are they? It seems reissues NEVER get good ad campaigns. March: agree…I smell other stuff going on in Guerlain V, whereas in Givenchy I get VETIVER. Mamma: OK…gotcha…Wy-OH!-ming. As they say, “I've driven thru” and thought it was beautiful (early spring). Annunziata: I got a new sample of Le De, just dabbed it on and must say, if the “original” formulation was more powerful than this…wow. I can't comment on L'Interdit…maybe someone else will chime in. Surely, sir, you do not tire of the infinite variety of flipflops to be found here? (It's true that Seattle fashion is unikely to divert you from your pursuit of perfume. But, in the globality of our times, there are plenty of flipflops in New York, Tokyo and even Paris. *waits for bela to comment*) Anyway, I love looking at the gray flannelness of Givenchy and being reminded – even peripherally – of Audrey, his muse. Thank you. Many many many years ago I had a drunken one-nighter with a French guy once who smelled delightful – don't remember much about the night but my brain was working enough to remember Vetiver. My Mom used to wear it – I think she had one of those mysterious Caswell-Massey apothecary bottles (I positively haunted that place after reading “Perfume”). I think I need to check it out, and get some samples of these variations everyone has mentioned. You know we're not talking the state, right? The state is beautiful, in a stark way, with that wild grandeur…. …this is beautiful, too, in a bucolic way. Cows abound. Tama: if you love vetiver you have LOTS of great fragrances to look forward to smelling. Just paid a visit to the Perfumed Court… sigh. My credit card hurts. I like the classic packaging and bottle. Just returned from Italy yesterday, and do not worry people for elegance still exists. It may not be next door but it has not vanished. Kevin I loved this review. It felt good to read it and a fragrance like Givenchy Vetiver let's us know that life can still be lived in a classy fashion. Bigdiscount.com has relatively inexpensive testers. Marianne: yes, Italy is a holdout for style…I'm sure you had a wonderful time there…any scent purchases? You know, life is just not fair. It's not your fault that I refuse to get on an airplane, and thus will never see Italy, but I'm still envious. I hope you had a wonderful time. Good to see you back. Kevin and Existentialist, my Hb and I had a wonderful time in Italy and it was only my second time in that lovely romantic country. Hb had been there several times before. And no, no perfume purchases this time but nice clothes and lovely leather shoes instead for the two of us. We had to make choices. Existentialist, you live in that part of the world where I would love to live. After having lived for 6 years in Canada and now 3 three years after our departure to Prague, I still have dreams at times that I come back feeling so incredably happy, and then I wake up.. I like to travel by ariplane but driving a car is not my favorite thing to do. I concur on all points. MW – I'm glad you had a wonderful trip to Italy. I was concerned you'd abandoned NST when I did not see you commenting. If air travel ever improves, Italy would be my choice of places to visit. What a beautiful, beautiful man. wait. I'm confused. Doesn't a flipflop (or any open-toed shoe for that matter) demand a pedicure? I wouldn't walk from the bathroom to the bedroom in funky feet, let alone show them to an unsuspecting, innocent world! Mamma: I've seen some SCARY feet over the last two weeks on the streets and in elevators …most of them belonged to men of course. Pedicure? What's a PEDICURE? HA! I know. I spend an inordinate amount of time NOT looking at El O's feet. I don't understand why guys (and some gals) don't take better care of their tootsies – after all, they spend all bloody day carrying one's carcass around. Treat 'em proper!